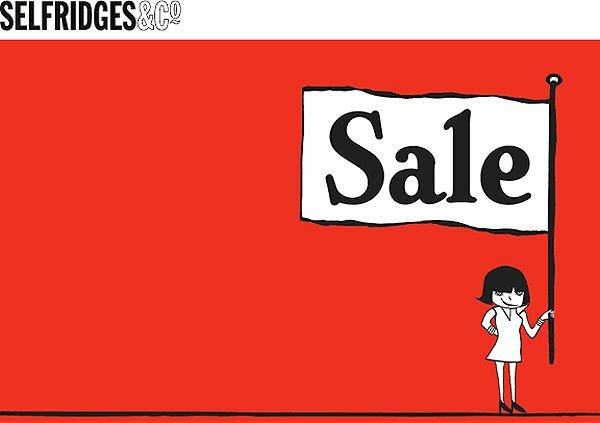 The well awaited shopping event of the year has begun…the Selfridges online sale is on now and the instore sale starts on Boxing Day! With up to 50% off many lines from high-street and luxury brands including Mulberry, Burberry, Ralph Lauren, Diesel, Topshop, Karen Millen and many more. As well as my favourites, Marc Jacobs, Stella McCartney and Michael Kors. Here my top 10 Selfridges sale picks with my favourite brands first! Trying my best to stick to the sale shopping tips from my last post I have carefully selected these items that I must get from the fabulous sale. Stella McCartney Wool Coat – I love this blazer style wool coat, it is a statement colour but perfect for the Spring Summer season coming up and until it gets warm this will brighten up my January! The silhouette is timeless and in the signature style of Stella McCartney. Marc Jacobs Sweatshirt – a classic summer essential, nautical stripes with an iconic character, this piece is exclusive to Selfridges and will remain a classic! Michael Kors Knit – a perfect simple knit that will remain a wardrobe classic, I love the clean shape that you can wear with almost anything and add glamour with a statement necklace. The chunky rib effect gives the added warmth for the cold snap coming in January. Michael Kors Sequin Trousers – now we’re in the countdown to New Year’s Eve, these sparkly trousers are just perfect for a casual chic look. Marc Jacobs Shades – a must have for every fashionista, now matter what season! I love the embellishment detail on the arms for added glam. Michael Kors Skirt – mixing textures is still around for Spring Summer and faux leather is now becoming a wardrobe staple. This skirt is a great piece for work, an evening do and can also work the whole casual chic look. Michael Kors LBD – you can never have too many classic little black dresses, especially now that leather is a wardrobe staple. If a full on leather dress isn’t your style, this is a perfect alternative….love! Stella McCartney Ankle Boots – As shoes are my weakness in sales especially, I could not resist these beauties! Platform ankle boots with a python print all over, the perfect finish for any outfit. Marc Jacobs Studded Bag – Studs have been huge this season but also add an edge to accessories, this colour is also great for Summer and the festival season. Stella McCartney Skirt – a statement piece that is still versatile as it’s monochrome and a classic shape. I love the embroidery detail on this skirt giving it a folksy edge.